The tour begins at Wakefield Common and leads in a loop that will bring you back to the Lake. Along the way, you’ll take a brief detour up Albion Street with stops on Foster Street. Enjoy! Your walk will begin on the west side of the street. The First Parish Congregational Church adjacent to the Lake at 1 Church Street was first established in 1644. The present structure (1912) is the fifth meetinghouse to serve the congregation and was designed by the Boston architectural firm of Hartwell & Richardson in the Romanesque Revival style. One Common Street, built between 1812 and 1820, represents one of the many Federal style homes on Church Street. Originally built in the Second Empire style with a mansard roof and bell tower, the William J. Lee Memorial Town Hall was the town’s high school from 1872 to 1923. Drastically remodeled with a classical pediment as part of a WPA project in 1937, and later receiving a facelift in 1996, the structure is sometimes called the Lafayette Building. It was officially designated as the Town Hall in 1958, and was later dedicated to the memory of attorney William J. Lee. The First Baptist Church (1872) on Common Street is a fine example of the Italianate style. The First Baptist Church in Wakefield was first housed in a building on Salem Street and then in a church building on the east side of Main Street, across from the Upper Common. It was consumed by fire in 1872. After the fire, this beautiful structure was built. Tragically, the building was hit by lightning and destroyed in October 2018. Razed on October 24, 2018. Our hopes and prayers are with the congregation, hoping they can rebuild. Artichokes Restaurant is housed in the Wakefield YMCA building. The Wakefield YMCA was founded on February 5, 1903. In 1908, construction began on the building, which stood on the site of Burrage Yale’s tin factory (1812). Later this site was occupied by the Emerson Shoe Factory. The Emerson Shoe business, established in 1805, expanded its operation to the Yale building, shown here, which was demolished for the YMCA. Shoemaking originated as a cottage industry in Wakefield, and was at one time the town’s most important industry. Local architect Edward Bridge designed the Post Office (1935) at 321 Main Street. Classical Revival in style, this structure sympathetically compliments the Library and provides a strong institutional component to downtown. Junius Beebe and his family donated funds for the construction of the Lucius Beebe Memorial Library (1923) as a monument to his father. The recessed entrance with four elongated columns capped by Ionic capitals highlights the structure’s importance. The Library, which was designed by Ralph Adams Cram, was enlarged in 1967 and received a significant interior renovation in 1998. The Odd Fellow’s Building, now offices of The Savings Bank. 349-53 Main Street (1895), which was dedicated as the Odd Fellow’s Building in 1918, was constructed by John Flanley, local resident and furniture business owner. Above the first floor storefronts, note the typically classical triple shallow recessed arches in the north and east sides. After a devastating fire in the 1990s, the Odd Fellows Building received a complete rehabilitation and restoration by The Savings Bank and is now joined o the adjacent 1969 bank building at 357 Main Street. The Savings Bank was originally chartered in 1869. Some founding members were such prominent citizens as Cyrus Wakefield, Thomas and James Emerson, Edward Mansfield and C. W. Eaton. As imposing as a Greek temple, the former Wakefield Trust Company (1924), now Santander Bank, exhibits a full entablature supported by limestone fluted columns. 369 Main Street (c. 1860) although much altered, is one of the oddest commercial buildings in the downtown. Built by Samuel Kingman, a tailor who later became Postmaster, the building housed the Post Office, among other local businesses. Kingman was a selectman, a representative to the General Court and a member of the Washington Rifle Grays. The structure was later known as the Bourdon Building, and still stands although it is almost unrecognizable. The Kingman Block is visible to the left side of this photograph, dated to about 1868. As you look down the street, you can see the steeple of the First Parish Church in the distance. Turn right on Albion Street, noting as you pass the Bourdon Building that you are in the approximate location of the very first institution in town — the meetinghouse that served as the first home of the Congregational Church, then the locus of both religious and secular power. John O’Brien photo. Courtesy of Chris Carino. The Renaissance Revival Building at 9 Albion Street was constructed in 1910 to serve as the town’s Post Office. It later served as the business offices of the Wakefield Municipal Gas & Light Department. The building continues in public service today, acting as the home of the Albion Cultural Exchange. 18 Albion St. represents roughly 1/3 of the original Quannapowitt House Building. The building at 18 Albion Street is thought to be part of the Quannapowitt House, a tavern and inn at Main and Albion Streets. Artist Joseph Payro’s rendition of what the original Quannapowitt House might have looked like. Its many alterations from Samuel Wiley’s 1795 home to a three-story commercial enterprise tells the story of the expanding town center. 45 Albion Street (c. 1830) dates from the time that the street was laid out, connecting two native American trails: Main Street and Elm-Cedar-Gould-Albion streets. John Wiley, a descendant of an early family, occupied this one-and-a-half story Federal style building with Greek Revival details. 68 Albion Street was built in the Italianate Style circa 1870-1874 by Charles F. Hartshorne, who was at this time Town Clerk and a railway agent. Later he established the insurance agency that still bears his name. Near Main Street Albion was a mixture of houses, barns and shops as early as the 1850s and its use as a commercial street increased the second half of the 19th century as businesses on Railroad (now North Ave.) and Main Street moved on to Albion. Turn back toward Main Street, walking past the Wakefield Item Company building (1912) at 26 Albion Street. The Daily Item newspaper was one of the first suburban papers inNew England to have its own printing and production plant. The newspaper had been established in 1894 by Fred Young, who previously had published a weekly paper in Wakefield. Young’s paper was successful and when he decided to sell it in 1900, it was ultimately bought by Harris M. Dolbeare, a publisher dedicated to high quality and to keeping up with printing technology which was to change rapidly in the next decades. 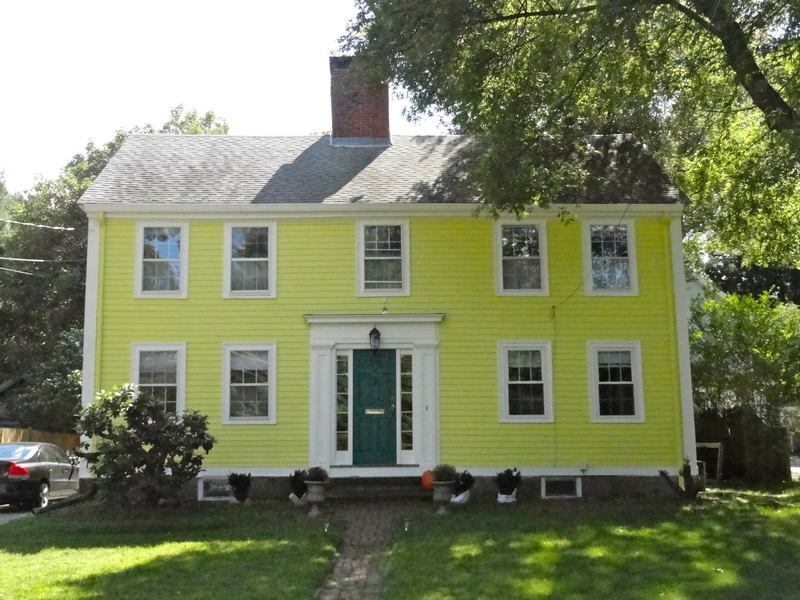 Turn right on Foster Street to see 7 Foster Street, built by local housewright Adam Wiley as part of the South Reading Academy (c 1828) on Crescent Street. The building was used as the first home of Wakefield High School in 1847. The structure was moved to this location in 1890 to make room for the construction of the Lincoln School. 9 Foster Street (c. 1900) was originally a fire station called Volunteer Hose Number 2 Company. Central Wakefield’s density had grown from 6,982 in 1890 to 9,260 residents in 1900, requiring changes in the town’s fire protection service. The Richardson Block at 405 Main Street shows commercial architectural style in 1901. The construction of this building was funded by Solon O. Richardson Jr. on his family’s homestead site. “Richardson Bitters,” the family business, was an important local product. Dr. S.O. Richardson Sr. was a generous benefactor to the town, and subsidized the town’s regiment, which, in his honor, named itself the Richardson Light Guard. Formerly part of the land on the Richardson estate, the Theatre Block was developed in the 1920s. The 900-seat Wakefield Theatre was an important entertainment site until the building burned in 1972, leaving only the section now used by The Farmland. The parking lot across the street from The Farmland was the site of the magnificent brick town hall donated to the town by Cyrus Wakefield. In 1868, Mr. Wakefield, the town’s largest employer and land owner at the time, volunteered to donate a Town Hall to the town then called South Reading. The town, delighted with the offer and determined to change its name from South Reading, volunteered to change its name in his honor. Cyrus was so tickled by this turn of events that he tripled the amount of money he had planned to donate and spent $100,000 on the structure, which housed not only town government but the library, the police station, a magnificent auditorium and a monument to the Civil War dead. It was dedicated in 1871 and sold to the town for the sum of $1. After a small fire in its basement in the 1950s, the town razed the building and moved town government to the old high school (the Lafayette Building). The $95,000 damage to the building was paid by the insurance company; that sum was exceeded by the cost of the move. The Americal Civic Center (1912) was built as an Armory and represents the town’s military history. The first corps was formed in 1640 and the Richardson Light Guard, organized in 1851, was the first occupant of this Armory. The town-owned building is managed by the nonprofit Americal Civic Center Association, which maintains this important community center. Main Street was the home of a few Colonial and Victorian style homes when Cyrus Wakefield chose the area now occupied by the Galvin Middle School for his home. The magnificent Second Empire estate (above) included the mansion, several outbuildings and a pond. The Galvin Middle School was named in honor of Wakefield native son General John Rogers Galvin, an historian and 4-star general, NATO’s Supreme Allied Commander from 1987-1992. Turn back now and cross at the light. Look down Water Street to see 27 Water Street on your right. It’s almost unrecognizable now, but it’s still there. The L.B. Evans Shoe Company built the structure at 27 Water Street in 1894 in order to consolidate their shoe factory operations. The building has been enlarged and greatly altered. The Wakefield Building or Taylor Block (1870) at 414-416 Main Street is a symbol of the town’s industrial economy. For a time, the Harvard Knitting Mill factory was housed here under a fourth-floor mansard roof. The building was built by Cyrus Wakefield as a real estate investment. This is probably the last remaining building that was built by Cyrus Wakefield. The decades after the Civil War were prosperous ones for the community. “The Butler Building,” built in 1875 is the last remaining three story brick building on this block. 380-382 Main Street (1875) remains alone where once stood blocks of masonry and wooden commercial buildings, many of which were destroyed by fire. The Italianate style building at 356 Main Street (c. 1855) is possibly the oldest surviving commercial building in town. Some of its original features remain. The Wakefield Cooperative Bank was formed in 1886, and was initially housed in the Odd Fellows Building. One of the bank’s early directors was Elizabeth Eaton Boit, co-owner of the Harvard Knitting Mill. Miss Boit was the first American woman to become a member of a bank’s board of directors. The Universalist Unitarian Church (1836) is the town’s oldest church building. (Shown below, in the photo above the text for 306 Main Street.) Originally built to resemble an ancient temple in the Greek Revival style, it received an Italianate re-styling in 1859. Its spire was removed due to structural problems. The Rockery was originally erected as the “Sylvan Grotto,” an ornament to Main Street in 1884. The Spanish American War memorial was added on the 75th anniversary of the Richardson Light Guard in 1926, and included “the Hiker” statue, the work of American sculptor Theo Alice Ruggles Kitson. The Federal style house at 316 Main Street (1822) was built for Benjamin Brown Wiley. Brick houses were uncommon in the South Reading of the time; the brick used for this structure was brought in from Danvers. During Wiley’s ownership, students from South Reading Academy boarded in the house. 306 Main Street (1810) was originally built as Benjamin Brown Wiley’s shoe factory, but it was converted for use as his home in 1850 when he sold the brick house at 316 Main Street to his son. Mid-nineteenth century alterations exist in the central entry, windows and side addition. The Emmanuel Episcopal Church (1881), initially built on Water Street, was moved to its present location in 1900. After the move, the parish house and rectory were completed. Wakefield Upper Common represents the remains of the original Common laid out by the earliest settlers and formally proclaimed public land in 1741. It originally extended as far as Water Street. 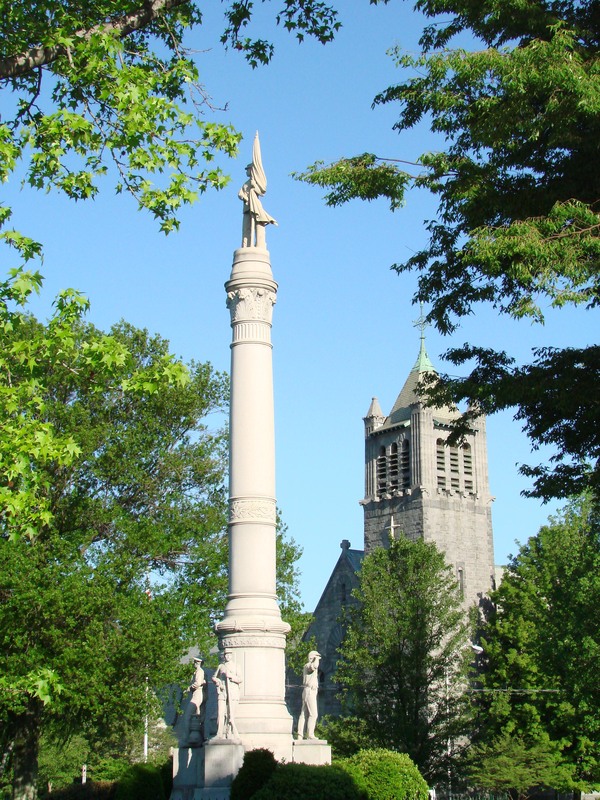 The Upper Common is now the home of monuments to those who served their nation in the armed forces, including the Soldiers and Sailors Civil War Monument (1902) donated by Harriet N. Flint. The Lower Common was originally called the Park when it was added to the town’s formal park lands in 1884. The Lower Common was the original location of the town’s first cemetery, and the Town House, built as the seat of government for the Town of South Reading in 1834. Wakefield’s iconic Bandstand was built as the “Music Pavilion” on the Lower Common in 1885. This online walking tour was written and compiled by Nancy Bertrand. It should be viewed as a work in progress, as it will be changed, polished and embellished over time. If you have enjoyed the walking tour, consider joining our mailing list to find out about other opportunities to enjoy the story of the town of Wakefield. Or consider making a donation to the Wakefield Historical Society, a nonprofit 501(c)3 organization. All donations generated by this walking tour will go directly toward the maintenance and preservation of the West Ward Schoolhouse (1847) at 39 Prospect Street. *All historic photos are copyrighted to the Wakefield Historical Society.